Lonafarnib is a well-characterized, late-stage, orally active inhibitor of farnesyl transferase, an enzyme involved in modification of proteins through a process called prenylation. HDV uses this host cellular process inside liver cells to complete a key step in its life cycle. Lonafarnib inhibits the prenylation step of HDV replication and blocks the ability of the virus to multiply. Since prenylation is a host process, not under control of HDV, and lonafarnib inhibits prenylation, there is also a high barrier to resistance with lonafarnib therapy. Virus mutation, a common pathway to drug resistance, is not expected to be a potential pathway to lonafarnib resistance by HDV. Lonafarnib is licensed from Merck Sharp & Dohme Corp (known as MSD outside the United States and Canada). In 2014, Eiger BioPharmaceuticals completed a Phase 2a proof-of-concept trial in 14 patients with chronic hepatitis delta viral (HDV) infection, announcing positive data in HDV patients treated with lonafarnib. Results were published in 2015 (Koh, C. et al., Lancet Infect Dis, 2015; 15: 1167-1174). 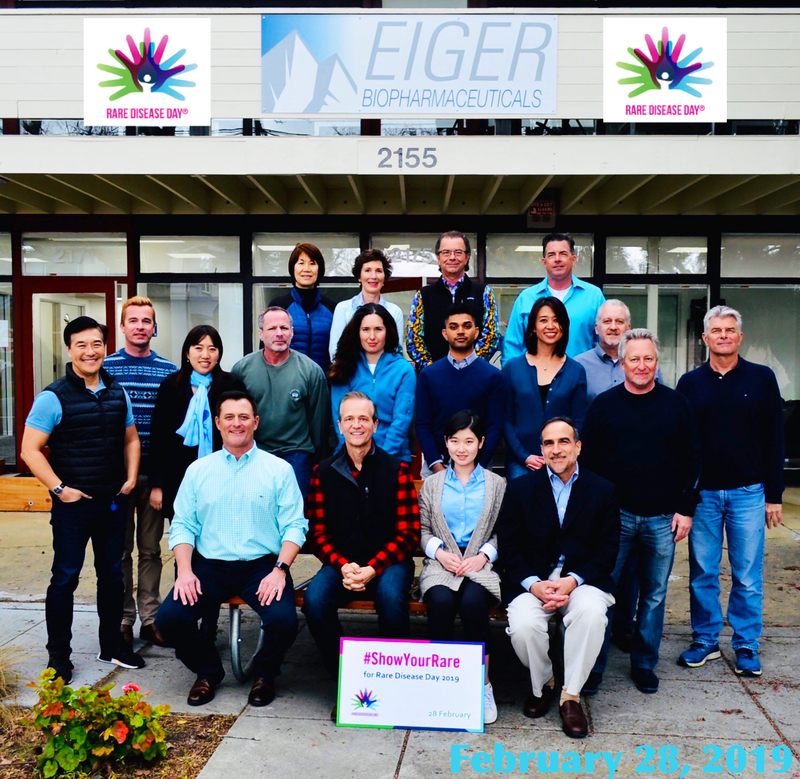 In November 2015, Eiger BioPharmaceuticals completed a parallel dose comparison study in 15 patients which randomized subjects to receive different doses of lonafarnib with or without ritonavir or pegylated interferon for four to twelve weeks (LOWR HDV – 1, LOnafarnib With and without Ritonavir in Hepatitis Delta Virus-1). LOWR HDV – 1 was conducted at Ankara University in Turkey. In December 2014, Eiger BioPharmaceuticals Bio initiated LOWR HDV – 2 (LOnafarnib With Ritonavir in Hepatitis Delta Virus-2) in over 30 patients, a dose-finding Phase 2 study of multiple doses of lonafarnib boosted by ritonavir with and without pegylated interferon-alpha, with the aim to identify possible combination(s) for the next longer-term studies. LOWR HDV – 2 is being conducted at Ankara University in Turkey and is currently enrolling patients. In September 2015, the NIH initiated LOWR HDV – 3 (LOnafarnib With Ritonavir in Hepatitis Delta Virus-3) in 21 patients, a Phase 2, randomized, placebo-controlled study of multiple once a day doses of lonafarnib boosted by ritonavir, with the aim to test longer dosing durations for Phase 3 studies. LOWR HDV – 3 is being conducted at the NIH and dosing has been completed. In November 2015, Eiger BioPharmaceuticals initiated LOWR HDV – 4 (LOnafarnib With Ritonavir in Hepatitis Delta Virus-4) in 15 patients, a Phase 2, open-label, dose-titration study of multiple twice a day doses of lonafarnib boosted by ritonavir, with the aim to test longer dosing durations for Phase 3 studies. LOWR HDV – 4 is being conducted at the NIH and dosing has been completed. The U.S. Food and Drug Administration (FDA) and the European Medicines Agency (EMA) has granted Orphan Designation to lonafarnib in hepatitis delta virus infection. The Orphan Drug Act (ODA) provides for granting special status to a drug or biological product (“drug”) to treat a rare disease or condition. Orphan Designation qualifies the sponsor of the drug for various development incentives. Orphan designation also provides for a period of market exclusivity or protection against generic entry. 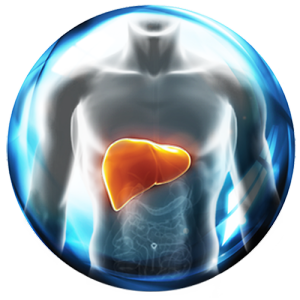 The FDA granted Fast Track designation to lonafarnib in combination with ritonavir for treatment of hepatitis delta virus infection. The FDA grants Fast Track status to facilitate the development of drugs intended to treat serious or life-threatening conditions and which demonstrate the potential to address unmet medical needs. 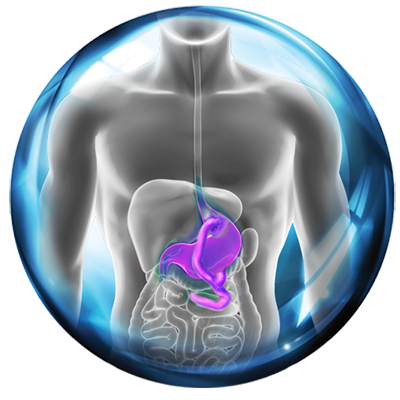 Sarasar® is a registered trademark of Merck Sharp & Dohme Corp.
After HDV enters a target cell hepatocyte, the genome is translocated to the nucleus where genome replication occurs without the need of any gene products from HBV. 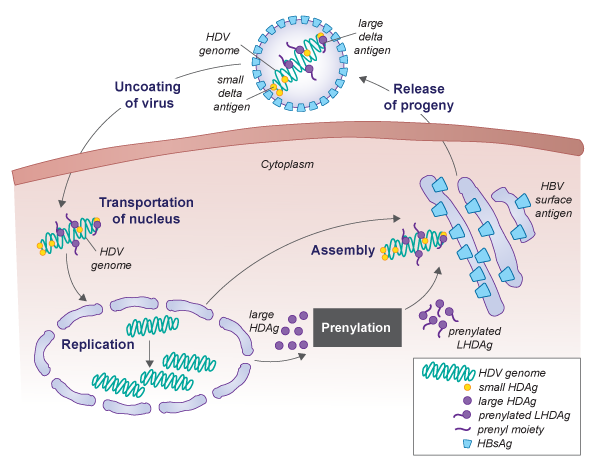 The complex of newly formed HDV genome and small/large delta antigen gene products must acquire a lipid envelope from HBV to complete the assembly process. An important interaction between HDV and HBV proteins has been shown to depend on the presence of the last four amino acids of the large delta antigen, comprising a CXXX box motif, where C represents cysteine and X denotes any other amino acid. The prenylation site on the delta virus large antigen was identified by Dr. Jeffrey Glenn at Stanford in 1992. This amino acid sequence is required for the protein to be post-translationally modified by farnesyltransferase (FT), an enzyme which covalently attaches a 15-carbon prenyl lipid-farnesyl-moiety to the cysteine of the CXXX box. Prenylation of the large delta antigen renders it more lipophilic, promotes its association with HBsAg and is essential for initiating the HDV particle formation process. 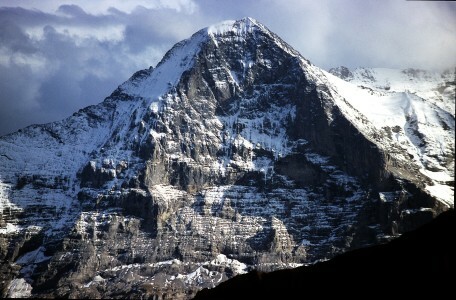 Elazar, M. et al. : Confronting New and Old Antiviral Threats: Broad Spectrum Potential of Prenylation Inhibitors. In Antiviral Drug Discovery for Emerging Diseases and Bioterrorism Threats. (P. Torrence ed. ), John Wiley & Sons, Inc. 2005: 249-261.